In this episode of About The Church, I'm joined by Dane Falkner and Greg Pedroza from DivineOffice.org. In Podcast Answer Man episode 174, I explained how Divine Office had offered to sponsor a trip to Podcamp Boston 5 that Stephanie and I are taking the weekend of September 25th and 26th. I'd like invite you to check out https://gspn.tv/divineoffice for more details about this generous sponsorship. I invited Dane and Greg to help answer some questions that I had about the Liturgy of The Hours, a spiritual discipline that I admittedly knew very little about. If you are interested in investigating this topic further, check out DivineOffice.org. 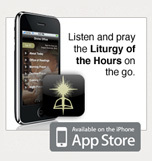 The liturgy of the hours are always available for free from the DivineOffice.org website. However, it is the funds from the sale of the iPhone/iPad application that helps financially support the ministry. Please note that the Divine Office application is a universal application that will work both on your iPhone and your iPad. Best part is that you purchase the application once and the content is refreshed daily without any ongoing costs. Click here to purchase the Divine Office in the iTunes App Store.